Set of 5 protrusion gauges for nominal diameter Hi-Lite® fasteners, sizes: 5/32'', 3/16'', 1/4'', 5/16'', and 3/8'' . Replaces Hi-Shear® 2-1522HST Gauge Set. Pin Protrusion Gauges from Omega Technologies are manufactured for use on all types of frangible and torque-control fasteners. These gauges determine if the correct length pin has been installed by determining if the pins projection is between allowable minimum and maximum ranges shown on the gauge. 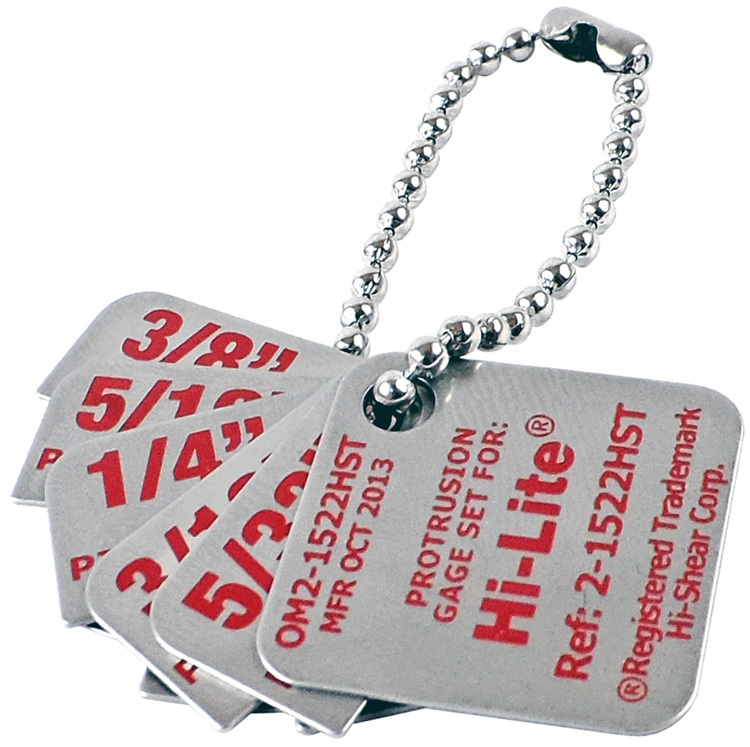 Gauges are available for Hi-Lok®, Hi-Lite®, and Hi-Tigue® systems. To select the correct gauge for the fastener, select the one that corresponds to the appropriate pin diameter. If the pin falls short of the minimum limit or exceeds the maximum, it must be removed, and a more appropriate size selected. Exceeding the maximum limit requires a shorter pin, and falling short the minimum limit requires a longer pin. The correct pin will lie between the maximum and minimum limitations giving a proper ratio of grip to protrusion. These are complete sets that include gauges for -5 to -12 fasteners. Related part number 2-1522-B. Constructed of full-hard, electro-chem etched, 301 stainless steel for durability, these gauges are assembled on a chain for easy selection and use. A large hole facilitates manipulation of the leaves, and extra large RED markings facilitate correct gauge selection. Rounded corners reduce risk of scratching surrounding surfaces. Gauges are .88" high and .88'' wide. Set of 5 protruson gauges for nominal diameter Hi-Lok® and Hi-Tigue® fasteners, sizes: 5/32'', 3/16'', 1/4'', 5/16'', and 3/8'' Replaces Hi-Shear® 2-1522 Gauge Set. Set of 5 protruson gauges for nominal diameter Hi-Lok® and Hi-Tigue® fasteners, sizes: 7/16'', 1/2'', 9/16'', 5/8'', and 3/4''. Set of 5 precision protruson gauges for nominal diameter Hi-Lok® and Hi-Tigue® fasteners, sizes: 5/32'', 3/16'', 1/4'', 5/16'', and 3/8'' larger than the OM2-1522 gauges. 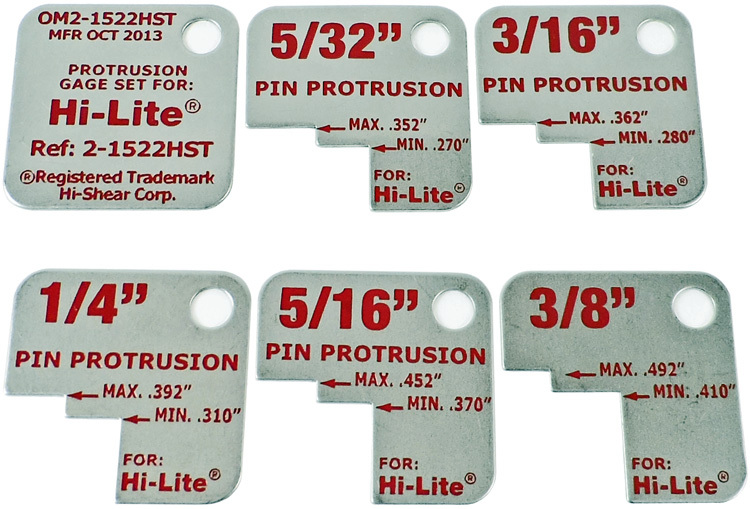 Set of 4 precision protruson gauges for large nominal diameter Hi-Lite® fasteners, sizes: 7/16'', 1/2'', 9/16'', and 5/8''. 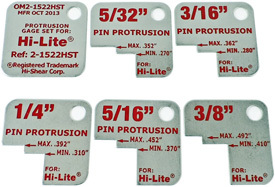 Set of 5 precision protruson gauges for nominal diameter Hi-Lite® fasteners, sizes: 5/32'', 3/16'', 1/4'', 5/16'', and 3/8'' larger than the OM2-1522HST gauges.